Tonight was a “can’t be bothered cooking night”. Nights like these the varoma comes in very handy! 25 minutes and dinner is done. This recipe is so versatile and be adjusted to suit your tastes. Use any vegetables you like. I just group the veg around them if doing it this way. 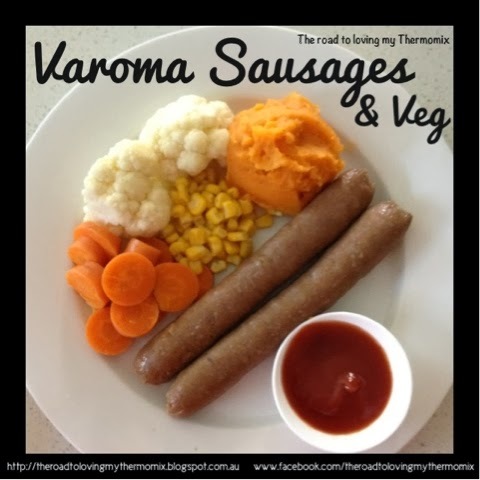 I often will varoma 8-10 sausages then freeze to pop in the lunchbox or for a quick dinner. A quick and easy all in one dinner. Peel sweet potatoes and cut into small pieces. Place into steamer basket and place basket into bowl. 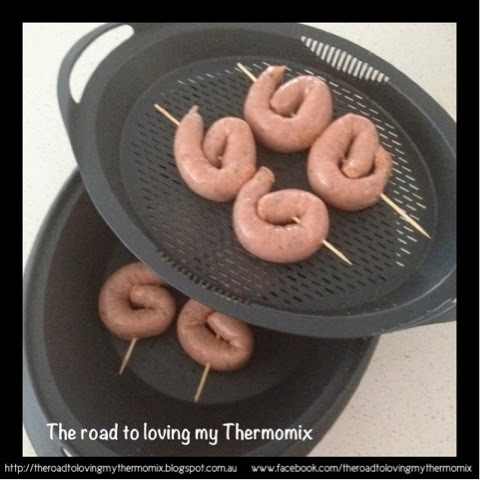 In the bottom varoma tray lay the sausages 5 on the bottom lengthways, 5 on top sideways. This allows steam to rise and even cooking. Cook on steaming temperature for 9 minutes, speed 4. Fill the top steaming tray with vegetables of choice. Cook on steaming temperature for 10 minutes, speed 4. Remove steaming attachment. Drain water from bowl (tip: some people save this water for stock - it may be slightly fatty however depending on your sausages) and put sweet potatoes into bowl with a little salt and pepper (tip: a little curry powder works well too!). Blitz on speed 4 for 10 seconds or until smooth. I peel the skin off the sausages at this point too. Serve sausages with mash and vegetables. Those with a Thermomix will know their steaming temperature as Varoma temperature. Other machines will know it as the steaming or ST temperature. Those with a Thermomix will know their steaming attachment as a Varoma. Other machines will know it as the steamer.